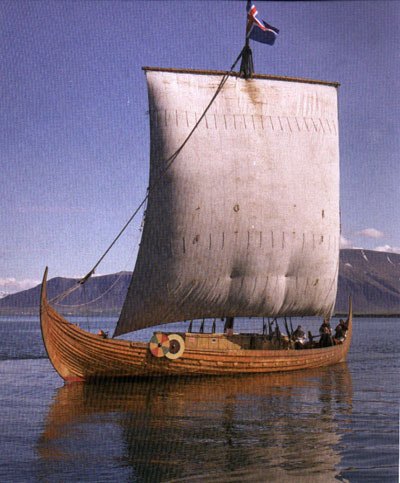 Web of Science: How long did the Viking voyages take? How long did the Viking voyages take? The sailing time for a given stretch in the Viking age was very variable. The voyages have been quickest when the wind direction was favorable and the wind strength moderate. The longest voyages occurred when a fairly strong wind was against you or the wind was so strong that it created high waves and you had to slow down for that reason. You could also lose your bearings completely in bad weather so that you were unable to make any progress towards your destination. In unfortunate cases the voyage would take a very long time, for instance the whole summer if you managed to get there at all. We also have examples from the sagas of crews who would stay for weeks in fjords waiting for favorable winds to start the ocean passing. In this period the most common major ocean crossings were between Iceland and Norway. Roughly speaking, you would then have two routes or two kinds of routes to choose between. 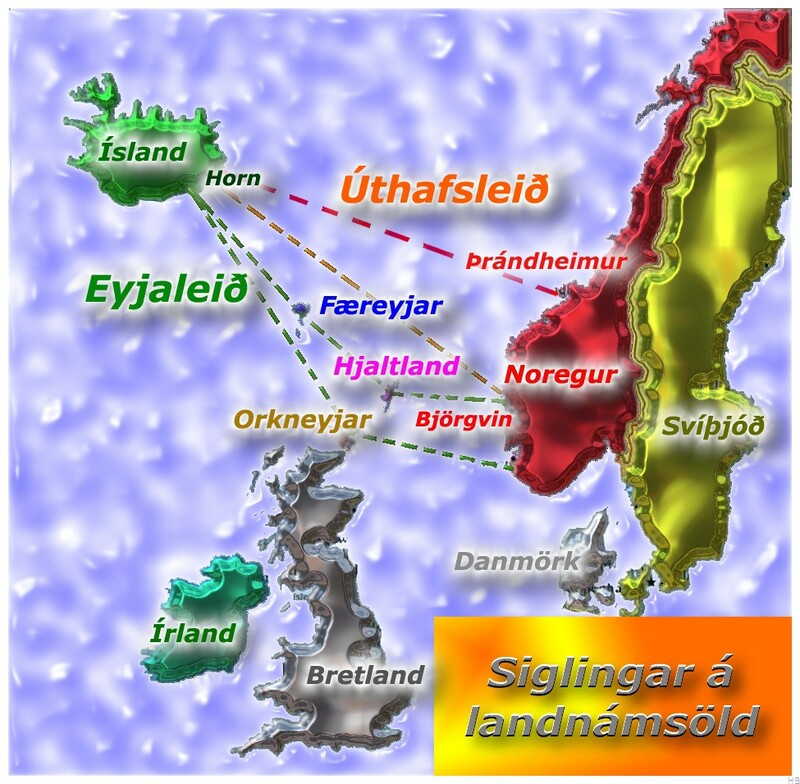 -- Firstly, you had what we may call the insular route ("Eyjaleið" on the map), and secondly the ocean route (úthafsleið). 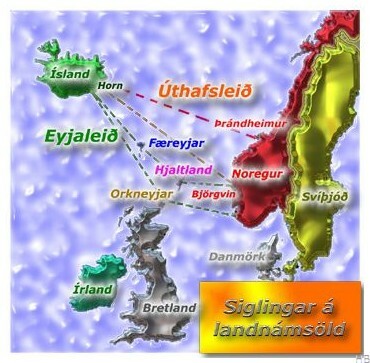 In the first case you would follow the North-Atlantic islands and sail from Norway to Shetland or the Orkney, then to the Faroes and from there to Iceland, and the reverse route on your way back. When you pick this route you can avoid sailing for many days on the open sea, without sighting land. – Taking the ocean route, on the other hand, you would plan to sail directly between Norway and Iceland and back. On the westward leg you would then have to take care to hit Iceland whereas Norway would be easier to hit on your way back because of its length. We can see from the sagas that it was quite common to sight or hit land in some place quite different from your intended destination. Then the crews would most often follow the coast until they reached their goal. This coastal sailing could take considerable time, for instance in Norway because of its length mentioned above. The quickest voyages between Iceland and Norway were of course done under ideal conditions and maybe with some luck. The shortest route between the countries is from the coast north of Bergen to the southeastern coast of Iceland (Horn) and the quickest voyages between these points may have taken 3 days or so. If you were traveling beween other places a few days should be added to this number. These figures apply to ideal conditions whereas in reality voyages beween the countries would often take several weeks. Thus, for instance, it was considered to be a feat worth special mention if the merchants would make two return voyages in the same summer. Then you have to keep in mind that people only sailed from May until September. A likely and common sailing speed in these voyages was 3-6 knots, where a knot amounts to one nautical mile per hour and a nautical mile is 1,8 km. Here we do not mean the temporary speed of the vessel relative to water but the speed which is realized in factual voyages from one given place to another which is also given on beforehand. The first kind of speed, relative to water and for a short period, could become considerabley larger. However, it is of crucial importance to keep these two concepts separate in the discussion. Further reading on this subject can be found at the author’s website and in writings listed there. Þorsteinn Vilhjálmsson. „How long did the Viking voyages take?“. The Icelandic Web of Science 28.1.2005. http://why.is/svar.php?id=4730. (Skoðað 21.4.2019).